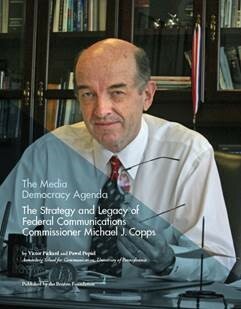 This report, part history and part strategy playbook, examines the tactics and policy priorities of former-Commissioner Michael J. Copps during his 10 years at the FCC. An analysis of Commissioner Copps’s tenure, his political strategies, and his legacy is a timely endeavor, both for its historical importance and for its contemporary relevance. As a commissioner in the minority during the George W. Bush presidency, Commissioner Copps was remarkably effective in leading a progressive policy program at the FCC – one that helped galvanize a larger media reform movement that remains active today. The report also fleshes out the core democratic principles that undergirded Commissioner Copps’s commitment to democratizing the media system. These included media diversity, public-service journalism, transparency in political advertising, and an open Internet. Drawing from three case studies of his major policy initiatives, the report sheds light on the specific tactics and strategies Commissioner Copps deployed during his time at the FCC. By providing an account of such a “usable past,” this report aims to help chart a path toward actualizing a more democratic media system. The report draws on interviews with Michael, and with colleagues, associates and former co-workers to provide a vivid picture of Commissioner Copps’ remarkable career as a policy advocate and a defender of the public interest. The report was written by Victor Pickard and Pawel Popiel. Pickard is an associate professor at the University of Pennsylvania’s Annenberg School for Communication. He is the author of the book America’s Battle for Media Democracy, and co-editor of the books Will the Last Reporter Please Turn Out the Lights, The Future of Internet Policy, and Media Activism in the Digital Age. Popiel is a doctoral student at the University of Pennsylvania’s Annenberg School for Communication. His research examines the politics underlying media and telecom policymaking. He studies the role of corporate lobbies, public-interest groups, and policymakers in shaping policy debates around the regulation of digital technologies, particularly privacy regulation, net neutrality, and emerging media and tech sector ownership issues.